"Never heard of them? Neither had I"
Richard and Belinda McArthur farm a mixed cropping and breeding farm north of Ashburton with 600 ewes and 200 replacements along with 1200 store lambs. 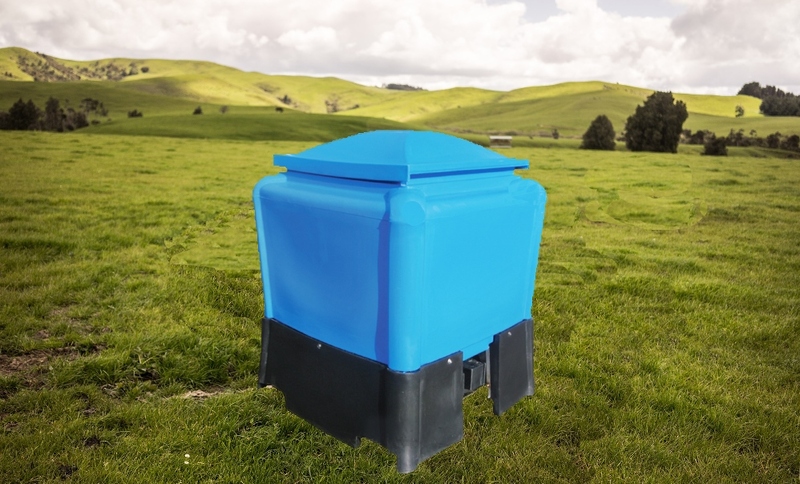 However it's the cropping side of the business that was on Richards mind when he first saw the info on the oddly named though potentially useful Jacky Bins from New Zealand agricultural plastic goods manufacturer Promax Plastics. "I plant a lot of seeds through my drill and the biggest headache is constantly filling it" say Richard. "So if someone had a way of bulk filling it easily and quickly and it was cost effective, I'd be interested" Interested he was as he read that the, new to market Jacky Bins, promise to do all he wanted and then some. He contacted his local merchant Ashburton Trading Society, ATS, to get some costings and some idea of how it would work on his place. After a few phone calls ATS talked with him, answering his questions and spurring his interest to buy not one but two Jacky Bins. "You see when I sow peas I thought there’s got to be an easier way. I’m putting in 300kg/ha so with two I can get at least 5 ha worth of peas and drop them into the drill from the tractor rather than empting countless bags, and the farm tidier, without all those bags”. “In fact I also used the bins to load fertilizer DAP direct from the works then into my drill. Labour saving, time saving and much easier on my back”. Richard went on to say that he’s even considering buying another couple of bins because he could see himself feeding out barley to his lambs with them. So what else do you like about them I asked? “Well the empty Jacky Bins are light enough to move around without machinery. I could even get them onto a trailer if I had to. The sides are smooth so whatever you have in them flows easily and the lever to empty them is mounted to the side, so no standing under a load and it operates smoothly with little effort required”. “I like the lids they slide open with one hand and they lock closed so can’t blow off”. “The two sizes I’ve got work well for me because the heavier products can go in the smaller one while I can store more light seeds for example in the bigger one meaning less time spent refilling”. “So what have you use them for so far Richard?” “Mainly for wheat barley and some fertilizer and they’ve worked brilliantly. I’m very pleased, they live outside as they’re UV stabilised, vermin proof and heavy enough not to be blow around in the wind. I just put pipes over my forks on the front end loader which seems to work fine though I’m thinking of getting proper pallet forks”. I now buy product in half tonne bags to fill them and I’m even thinking of asking my seed merchant in Rakaia to sell me bulk rather than bags, it could work out cheaper for me and him”.